We have two (possibly three) busy days ahead of us, first, my husband's delayed family Christmas is tomorrow. We will be spending the day at his brother's place, opening gifts, eating (more) turkey and drinking wine. I don't have to bring anything, but I will be bringing wine, chocolates, cookies and butter tarts (my mom sent me home with some wonderful things after Christmas, including a container of her most excellent pie crust, ready to be rolled and turned into a pie. I made some of it into tourtiere, which we've been eating for the last two days, and the rest of it has become butter tarts). Speaking of tourtiere, it may have something to do with my kids' French heritage, but I have to say they go crazy for meat pies. I will be posting soon on the amazing array of food and ingredients that I have been gifted in the past while, but in the meantime I will say briefly that the other thing that I might be bringing to the party tomorrow is fresh, homemade goat cheese, because I became the bemused owner of 68L (give or take) of frozen goat's milk over the holiday. Following Second Christmas is New Year's Eve, which also happens to be my birthday. We have started a tradition among our friends, and named it "Breeders' New Year": we invite all of our friends who have young children (and they invite some of their friends too) to come over, bring the kids, some food and wine, and have a chaotic but enjoyable New Year's Eve party which usually wraps up around 9PM. And for any of you who need more ideas for a simple foodie New Year, a good friend sent me this link to an L.A. Times article. Some good stuff here! Last weekend, I catered a Christmas party and wine tasting with Doug Reichel Wine Marketing. It was the first time I had catered for people who didn't know me at all. I discovered a few things during this adventure, some related to cooking, and others relating to me. Apparently (who knew?) there's a lot of ego attached to my cooking. I claim to love cooking for itself alone, and that people enjoying the food that I make is just an added bonus. This is mostly true, but I found myself faced with clients who didn't know what I was capable of, and having to prove myself, which made me a little grumpy. If I were more of a drama queen, I may have shrieked, "Don't you know who I am?!" But really, who am I to these people? I'm someone they've hired to perform a service, and a fairly lowly service at that. The wine was the focus; the food was a sideline. Once I wrestled with all of this for a few days, I got over myself and decided to treat the whole thing as a learning experience, and a chance to have a good time with Doug, whose wine I love, and whose company I enjoy. From a catering perspective, I learned the importance of clear communication of expectations. I had to make some items ahead of time, and needed final numbers early. I didn't quite communicate this as clearly as required, and my client went out of town, then replied, FOUR DAYS before the event, that she was expecting 37 people instead of 50. I had said I would charge her per person, but a 25% reduction in numbers, on such short notice, would have eaten into my profits considerably, since I had already made the most labour-intensive items, and had purchased most of the groceries. She was reasonable about it, though, and so we both ended our experience satisfied, she with the product and what she was charged, and me with a reasonable profit (as long as I don't count the hours of list-making, planning, and lying awake trying to think of everything that might possibly go wrong). The event went over well, and I also learned an important lesson in the midst of it: the art of letting go and not fretting over results that don't meet my high standards. My Bearnaise sauce didn't thicken, because I was paranoid of curdling it. The oven didn't run as hot as mine, so my pastries didn't brown as I would have liked. Those two dishes were the ones that got me the highest praise from the party goers. They could have been better. But I was the only person who knew that. My days feel empty, now that I don't have to think about the planning of this event anymore. And that is a relief. Now on to wrapping up Christmas baking (one more item on my scaled-down list!) and then wrapping up Christmas baking (as gifts)! My book-recommending librarian friend strikes again, ordering The Art of Living According to Joe Beef: A Cookbook of Sorts for me to borrow from the library. I started off flipping through it, thinking it looked kind of fun, and very much a restaurant that I will put on my bucket list for the next time I travel to Montreal. But the recipes (such as Lièvre à la Royale—taking two days and involving a rabbit, a hare, a veal trotter, caul fat, foie gras, truffles, and the reserved blood of the hare, among other things) weren't something I would be likely to try at home. At least not at first glance. As I looked through more carefully and got sucked into the stories and history of Montreal, and the playful voice of the whole thing, I stumbled across some real gems. For example, in their subsection titled "Tall Tales, Taste and a Few Theories" (all three of which I am a fan) they describe why the Big Mac is so popular (according to them, it is a perfect balance of salt, fat, sugar, acid and bite)—and then set out a series of simple recipes that combine the same perfect balance of flavour. This will in no way convince me to go out and buy a Big Mac, since my farm upbringing (and lifetime access to real, healthy beef) has spoiled me forever for anything from McDonalds. I have never been able to enjoy it, even as a child. I always wanted to, because you're supposed to, but I was always disappointed in how it tasted. But I digress. It was the chapter titled "The Smoker", backing on to the next chapter, "Building a Garden in a Crack Den," which got me totally hooked. They actually provided their plans for a homemade smoker (something my dad has built), and tucked in the middle of a book that uses all manner of meat, fat and foie gras, is a gorgeous chapter outlining their monthly garden harvest schedule and a recipe for Jerusalem Artichokes with Ketchup. I'm getting more and more into the book as time passes. It's lying open next to me and I just discovered a totally doable recipe for "Onion Soup Sauce," described as "tasting like an extraction of the essence of onion soup." I gotta go. Gotta get back to the book. I always marvel at recipes that taste so wholesome and delicious and have very few ingredients. I love making split pea soup because you can't get much simpler: toss a ham bone and some other ingredients in a pot, bring to a boil, simmer a couple of hours, and voila! Dinner an habitant would love. I got this recipe from the ancient Good Housekeeping Illustrated Cookbook, copyright 1980. I added the celery, but otherwise, it is more or less exact. In a large Dutch oven over medium heat, heat bone, split peas, carrots, onion and water to boiling. Tie allspice, peppercorns and bay leaf in a piece of cheesecloth. Add to bone mixture. Reduce heat to low; cover, simmer 1 hour (or more, until peas have broken down completely). Discard spice bag; salt if necessary. Remove bone to cutting board. Cut off meat and discard bone. Cut meat into bite-size chunks and return to soup for serving. My kids ate full bowls of the soup. This may be partly due to the fact that I implemented a moratorium on snacks today, since D has been living on peppernuts, crackers, and the occasional mini-mandarin. So they were hungry! So there it is. We've used up the last of the gigantic ham. Check out Planet S Magazine for my Top Ten Gifts for foodies! I have long espoused the benefits of planning ahead when it comes to cooking; actually, when it comes to life with small children, planning ahead improves the potential outcomes of almost any situation (at least part of the time...too many variables for a guarantee any stronger than that). I was pleased with my momentum this week—I planned to make an appetizer for a party that would leave me with a cranberry-teriyaki glaze matched to a recipe for Asian braised short ribs, and pulled short ribs out of my freezer to thaw. I made extra poststickers (my appetizer of choice), so we could eat them at our convenience after I froze some. Then, my parents showed up. I love them dearly, but they invariably add to the chaos. This time, my dad did so by showing up with a 10-lb. picnic ham as a gift. I had just tossed it into my (brimming) deepfreeze when my husband commented that it would be nice to have ham for dinner and sandwiches throughout the week. Out came the ham, and in spite of the fact that dinner that night was to consist of only him and the boys (I was going to the party), the 10-lb. ham went in the oven. Turns out the potstickers can't really be frozen, because the filling was too wet, and they were meant to be cooked right after filling them, but I didn't because I played volleyball right before the party, so I made the potstickers ahead of time. The wet filling made the wrappers extra gooey. They need to be cooked right away to be saved. So. They probably should be cooked tonight. Planning ahead seemed like a good idea, until a ham got tossed into the mix. I guess I should enjoy the fact that I probably won't need to cook anything for any meal for the remainder of the week. I can rest up for my catering event next Saturday. And maybe catch up on Christmas baking...and, do my dishes. Today I made 100 beef empanadas, 100 blue cheese shortbreads, and then, in a fit of madness, decided to start on the pork potstickers that I plan to take to a girls' night tomorrow. Why I am making potstickers fast on the heels of 8 dozen empanadas, I have no idea. It's times like this that I realize why I felt a kinship with Julie Powell when I read Julie & Julia (the feeling ended when she imploded in her sequel, Cleaving). I have been neglecting my blog posts while I scramble for sleep as Baby G cuts his last one-year molar, while also trying to coordinate plans for Christmas baking and gifting. I also picked up a catering gig for the 17th of December, which I'm looking forward to, but which also requires quite intensive planning in order to pull it off without a hitch. Hence, more thinking and list-making is going on, rather than blogging. The Spaghetti with Cauliflower, Green Olives and Almonds is a particular favourite of my husband and me, served with whole grain spaghetti. It is one of the few olive oil-based sauces that I find completely satisfying. Added Parmesan helps, too. I will post again soon with the developments of both my catering gig and Christmas baking plans. First steps are in place—I purchased the Lee Valley Gingerbread Mold and gingerbread decorating ingredients today. I can't resist anything for the kitchen made from cast iron! Excited to use it. I set myself up for this. I know I did. A year or so ago, I purchased a pyramid-shaped fruit holder, thinking that I liked the idea of decorating with fruit, it would be cool in my newly renovated kitchen, and D would love to unpack the fruit onto the stand. All of this proved to be true, but I did not predict the regularity with which I discovered all my lovely fruit to have single bites taken out of every single piece. It's inevitable when the fruit is out on the counter, just begging to be tampered with. I hadn't used the holder for a while because I had been discouraged by D's aforementioned treatment of the fruit (taking bites out of all of them and putting them back). But it had been a while, and I had some pears that needed ripening, so I plunked them on the holder, and promptly forgot about them. Enter not-so-baby G, who has learned by observing his brother that moving chairs to the counters and climbing on them opens up a whole new world of opportunity. By the time I started paying attention, all the pears had been removed from the holder, one dropped, two revealed that they had started to rot, and the rest of them had single bites taken out of them. I wondered out loud about the two that had started to turn. D piped up, "That's probably because I dropped them and they bruised." Ah, thanks for the info. I suddenly had a lot of pears that needed peeling and turned into something, with little time to do it. I decided to poach them (a fancy name for stewing, really), using apple juice and adding some of the cranberries (in the freezer) left over from Thanksgiving. The results made a refreshing dessert! Place all ingredients in a pot and bring to a boil over high heat. Don't worry if the pears aren't covered by liquid. Lower heat, cover and simmer for about 15 or 20 minutes, until the pears are soft and the cranberries have burst. Sweeten with honey or a bit of sugar if desired. I didn't sweeten it at all, and while it was a bit tart, we all still enjoyed the flavour. I apologize for my long absence; two weeks ago, I was wrapped up in a preschool fundraiser that included a bake sale, which I was preparing for. My husband also hurt his back (happily, it is already much improved). I had a full weekend of workshops and other events. Then my kids had a stomach bug. Then I spent the long weekend traveling to Vernon, BC to visit my sister and her new baby. In brief, let me share the few foodie adventures I've managed to fit in as I fly through life at warp speed. I found the two cupcake recipes I made for the bakesale, from Martha Stewart's Cupcake book, on a blog devoted to making all of the cupcakes in Martha Stewart'a Cupcake book, and another one devoted to making cupcakes. Handy! Thanks to Way More than 52 Cupcakes and Holly's 101 Cupcake Challenge for reminding me that I really need to take photos and post them on my blog. Gorgeous photos on these sites. I also made Chewy Oatmeal Cookies from King Arthur Flour's Whole Grain Baking for wrapping individually and selling. I'm happy to say that all my baking sold, and the majority of it sold to the preschool executive before the bakesale had even officially opened. I'd say the chai tea cupcakes were a bit dry, but I think that has to do with a cake philosophy that aims for "fine crumb" which is is usually less moist and dense, and therefore...well, dry. My family prefers moist cakes, at the expense of fine crumb. On my brief trip to Vernon, I spent some time with friends in Kelowna, who rescued me from the airport while my sister was trapped on the Coquihalla. We stopped in at Hoang Gia Vietnamese restaurant and picked up fabulous Pho (the real thing with rare beef and tripe! ), as well as a grilled meat/vegetable wrap-your-own fresh roll dish that was super yummy. Today, glad to be home and spending time with my own kids (nieces and nephews are nice and all, and the new baby is absolutely precious, but they just aren't the same as my very own), I remembered that D got a baby gift of alphabet cookie cutters, which we have not yet used. I decided to bake cookies with him this afternoon, and it was quite a hit. He was happy and helpful, and only a bit messy, and I got a much better sense of how many letters he recognizes and how fascinated he is with the idea of spelling his name. I was worried that leaving the dough to chill for a half-hour would test his patience, but we simply read a story while we waited, and he was just fine with it. Here is a nice whole-grain cookie recipe for rolling, cutting and decorating. Not too sweet, so it can take some icing. Our cookies weren't very big, and D was ready to just eat them by the time we had cut and baked them, so ours didn't get decorated. A different project for another day. Chewy Oatmeal Decorating Cookies. Enjoy! One of my very close friends is grieving the loss of her mother. Her funeral took place today. I knew this, but in the Halloween madness it was not front and centre for me until I remembered a recipe. Then it all came flooding back. It all started with Halloween, and the discovery that my jack o'lantern pumpkins were lovely and fresh, with beautiful, thick flesh. I decided they were too good to go to waste, and planned to haul them in before they froze and turn them into something yummy. The first time I met her, my friend's mom and I got talking about food. I was in my early college years, and just getting warmed up when it came to my food obsession. She had several interesting books and magazines, which I leafed through as we visited. While I was there, I copied several recipes down, by hand, onto folscap. One of them was Harvest Pumpkin Bisque with Nutmeg Thyme Croutons. I have made this soup at least once a year since, from that same piece of folded paper, stuffed into my recipe box. It is one of my favourite soups, and I am grateful to my friend's mom for introducing it to me, every time I taste it. Fitting, then, that I should suddenly crave it as her nearest loved ones are wishing her a final farewell. As for me, I will make soup. It still has not been agreed upon what we will hand out to trick-or-treaters on Halloween. We are not against candy per se, but we also don't like to buy into rampant commercialism either. Last year was a compromise. I found some Kernels popcorn bags, and bought a few, and when those ran out we offered raisins. Raisins didn't elicit particularly enthusiastic responses from our ghoulish guests. What I really wish is that people weren't so paranoid about homemade and unwrapped gifts. The whole 'razor in the apple' fiasco really ramped up purchased, pre-packaged Halloween treats, now didn't they? How convenient for the makers of those pre-packaged Halloween treats. (Oops, my husband's conspiracy theory tendencies are rubbing off on me.) I've been trying to figure out a way around that, like putting my address on a sticker on a popcorn ball, for example, in an effort to reassure parents that I'm not trying to poison their children. But there are obviously inherent flaws in that approach as well. The days are counting down, and no satisfactory solution has been reached. Help! Then there's the preschool party. We've been asked to bring something, and I wanted it to be at least slightly thematic, since I'm a compulsive themer, but I didn't have a lot of time or inclination to do anything over the top. They are three- and four-year olds, after all. They aren't going to care THAT much. A quick internet search found this: Martha Stewart's Goblin Flatbreads. Perfect! Nut free, healthy and low-key enough to please the teacher who likes to encourage people not to go overboard, using pizza dough that was already in my freezer, and I think (hope) the kids will enjoy it, as long as they're not too freaked out by the little ghosties. I'll let you know! Fresh vegetables and yogurt cheese dip with olives and sweet pickles (a stand-by for me from Madhur Jaffrey's World Vegetarian). Recipe below. Poured a Chilean Cabernet Merlot to go with, and enjoyed immensely. One of my oldest friends orders books for the public library. She, being a foodie herself, enjoys encouraging my own foodiness, and will occasionally come across a cookbook that she thinks I'll like. She then puts it on order on my library account. I then get a call from the library, saying the book I requested has arrived. When I get there, I discover that I haven't requested the book at all, but rather it has been requested on my behalf by my thoughtful friend, who is so far two for two in nailing the kinds of books I'd like to read. The first one was The Flavor Thesaurus, a collection of 99 essential flavours, and a discussion of how those flavours work together, with examples of chefs who have used them and/or recipes where they have been used together. I immediately fell in love with it, and tried to renew it, but it had already been requested, so I had to return it before I could finish with it. I haven't yet gone out and purchased my own copy, but I'm definitely going to—it's a book I will use as a resource, I'm sure. The second is Odd Bits: How to Cook the Rest of the Animal, by Jennifer McLagan, author of Bones: Recipes, History and Lore and Fat: An Appreciation of a Misunderstood Ingredient. I have only flipped through Bones, but loved the idea of the book. When Odd Bits turned out to be my "library gift," I couldn't wait to dig into it. In fact, I couldn't resist flipping it open while stopped at a light on the short drive home. I know I'm at risk of alienating myself from my vegetarian friends by getting into this, but I regularly have 'odd bits' in my freezer. My dad delights in passing on some of the more obscure meats that he ends up with from butchering his own animals, and friends will often line me up with their weird meat connections. Until this evening, I had a beef heart, beef liver, soup bones, chicken hearts, and pork hocks in my freezer, along with the usual hamburger, chicken, sausage, steak and so on. The heart is no longer in the freezer, because it has been transformed into a gorgeous Moroccan braise with dates and preserved lemon, served over couscous, thanks to McLagan's beautiful book, and most importantly, thanks to my girlfriend, who saw a cookbook with raw pig's feet on the cover, and thought of me. I'll be inviting my girlfriend over for Sweet and Sour Pork Hocks with Savoy Cabbage and Capers to thank her. I see many benefits to buying local, happy chickens and storing them in my freezer. This week I realized how easy it is to stretch one of those largish birds (just under 6lbs.) into three weeknight meals. I'm usually not one for economizing when it comes to food, but this week I was quite pleased with the idea of using one bird three different ways. I already mentioned the first meal: Mark Bittman's Curried Chickpeas and Cauliflower with Chicken, which I made by chopping up one leg, thigh and partial breast of my still mostly-frozen chicken. I saved the bones for later. Next came another Bittman recipe, Anise-scented Poached Chicken with Squash which I shared in an earlier blog, except this time I had a kabocha squash, so I used that. I made the white-cut chicken dipping sauce to go with it, and served it with the poaching broth over soba noodles, and it was a hit with everyone. Cover with water (in this case, I used yesterday's poaching liquid as part of the water I added) and bring to a boil. Lower heat, skim off foam and let simmer gently for two hours. Strain solids and remove all the pieces containing meat and let them cool. Heat the fat and cook the carrots, celery, onion and garlic for about 8 minutes, or until they begin to soften. Stir in chicken stock, potatoes, squash, bay leaf and dill. Cover and bring to a boil. Lower heat and simmer 10 minutes, or until potato and squash are tender. Add chicken and sweet pepper. Remove the bay leaf. Whisk flour and stock together in a small bowl. Add mixture to saucepan and cook until the stew thickens (a couple of minutes). Season and serve. I served this with another batch of fresh oat rolls from King Arthur Flour's Whole Grain Baking cookbook. I'm on a roll (no pun intended, well okay, maybe it was) with baking buns. Easy peasy with the Kitchenaid Mixer! I have to say that I am entirely sold on using quinoa flour in place of wheat flour for thickening soups and stews. The stew is actually noticeably more filling, I think due to the additional protein hit from the quinoa, and it thickens in a way that seems much less 'glue-like' than flour. And the flavour was excellent. So there you have it. Three dinners for a family of four (although the kids aren't fully grown) out of one chicken. Sometimes my kids surprise me. The last two nights, I have made meals that I worried would be rejected outright. Not so! Here is proof that if you push the envelope occasionally, you may be surprised with your kids' responses. While Baby G wasn't at his best (cold and teething) and didn't eat overmuch, D had three servings of the pasta and carrots, as well as having seconds of the sausage. I'm not sure he touched the onion/grape sauce on the sausages, but I certainly enjoyed it, and it didn't seem to slow him down as far as eating the sausage was concerned. I was pleasantly surprised by the farfalle—herbs de Provence contain thyme, basil, savory, fennel seeds and lavender—and they were just right as an accompaniment to the sweet Italian sausages. Coincidence? D slept through the night and actually slept in a bit this morning. Maybe because he didn't wake up hungry? I was concerned the recipe was a bust, because it seems overly fussy for what it is (cook the chicken, then add the ginger and onions, then remove the chicken from the pan, then add the chickpeas and curry powder, fry THEM, then remove them, then cook the cauliflower in the same pan in the coconut milk, then add everything back in...made me wonder why I couldn't just simmer it all together for a more harmonious and tender result. I sort of did that at the end), and the spices blackened quite dramatically in the hot pan between additions. The final results looked kind of rustic, with dark bits in the sauce, but it didn't taste bitter at all. And Baby G went to town on those chickpeas, in spite of the curry powder (I did skip the chili in order to make sure it didn't get too spicy for the kids). D called the chapatis 'tortillas' and filled up primarily on them, but also the cucumbers, and tasted some of the stew. Both kids also sampled the chutney, to mixed reviews. The best part was that my husband and I got to enjoy a version of curry (we love it, but don't get to have it often because of the kids' sensitive palates) and the kids were satisfied, too! In spite of my misgivings, I would do it again. Chapatis were very easy to make with the hlep of my Kitchenaid Food Processor and Lodge Cast Iron Griddle. There are many more flatbreads in my future. Last week was a bit of a blur—many times I wanted to post my activities, but I opted for sleep or cleaning instead. First off: Thanksgiving was a great success. The dry-cured and herb-stuffed turkey was succulent and infused with flavour, and the fresh herb bread stuffing was everything I hoped it would be. No complaints, and in fact, enthusiastic reviews from all the guests. I mentioned, ruefully, to my father-in-law, "I guess I'll have to get up at 6AM again next year," since the turkey was good enough to justify the early wake-up call. Instead of reassuring me that that wasn't necessary, which is what I hoped he'd do, he said, "You'll get used to it." One of the benefits of a roasted turkey, if you're up for the challenge, is finding things to do with the leftovers. That isn't as much of an issue with a deep-fried turkey, because the carcass can't really be used for much. This year, though, I was prepared for days of post-turkey...turkey. I'd be happy to share recipes for these if anyone is interested; I confess that right now, it is late and I must get myself off to bed. One more thought: my craving for chicken has certainly subsided since the turkey-fest. I have cooked quite a few turkeys in my day, beginning with one that played the role of procrastination tool when I was supposed to be writing a paper in grad school. That one, while popular at the potluck I took it to, was not my most successful; it was undercooked, and my paper REALLY could have benefitted from the extra attention I gave instead to roasting a bird. The stuffing for that one, however, was quite excellent: Apricot, Orange and Wild Rice Stuffing, which could easily serve as a vegetarian dish all on its own, if you chose not to stuff it into the body cavity of a large bird. Another year, when I lived in Vancouver, I had some adventures with cornbread stuffing. I baked the cornbread the night before Thanksgiving, and then left it out on our outdoor freezer overnight, because our refrigerator was full of a large turkey and several other goodies. I woke at 5AM, with the sense that something wasn't right. I opened the back door to check on things, only to discover two raccoons with their faces buried in my cornbread. I had to re-bake another batch of cornbread first thing in the morning, because my roommates wouldn't go for my suggestion of scraping off the parts the raccoons had touched. I can't imagine why not. My next revelatory bird was roasted here in Saskatoon, using Emeril's Brined Roasted Turkey recipe. This was my first experience with a Pine View Farms turkey, and I attribute its success partially to the brine and partially to the amazing quality of the turkey prior to any interference on my part. I continue to be enamoured with the concept of brining, particularly where a deep-fryer is concerned. Last year, I went for Alton Brown's deep-fried brined turkey. Being easily swayed toward anything resembling instant gratification, this is a strong seller in my books. A turkey can be brined overnight, and ready to eat one hour after beginning to heat the oil. Forget all that you've heard about deep-frying being dangerous. Well, perhaps don't 'forget it.' Just be smart! If you follow the instructions, it's quite safe. And delicious! There is still something to be said, however, for the traditional roasted bird packed with stuffing. And I have now, after all the years of helping my mother pull off Christmas/Thanksgiving/Easter/Birthdays for 30+ people, as well as my own personal experiences, outlined above, reached the point where I am ready to experiment a bit. Which leads me to this year. Number one, I will never purchase any other turkey but a Pine View turkey, if I can help it. These are gorgeous, healthy, tender, juicy...what other adjectives can I employ...YUMMY. They are also expensive, but heck, you only buy one or two a year. Why not do what I do and splurge on the turkey and ask your guests to bring some of the other dishes? They'll be happy to oblige. Second, I have been having great success with dry rubs. This is a simpler method than brining, and while those of you new to the process may be concerned that putting so much salt on something is bad for you or will make your meat taste overly salty, I assure you that adding the factor of time makes all the difference. I have been doing dry rub experiments, using chicken, all summer. I have been having great success using the simplest of simple dry rubs (recommended by such chefs as Thomas Keller and Judy Rodgers) on roasting chickens and roasting them over indirect heat on the barbecue. Seriously simple. As in: salt and pepper. I generously salt and pepper my bird, inside and out, preferably the night before, but often just earlier in the day, and then heat one burner of the bbq and place the bird on the other side. I turn it once while it roasts, but otherwise, I ignore it completely. Delicious, with salty, crispy skin. Sometimes I add herbs under the skin, a la Zuni Cafe, but often I don't. Although I have had success with just picking a huge handful of herbs and stuffing it in the cavity before I toss it on the bbq. I must add the requirement that you use a fat, happy, healthy chicken that didn't know it was on the way to the chopping block. Just any old store-bought chicken doesn't have enough flavour and natural goodness to pull off this light seasoning treatment. Anyway, I've been loving the idea of doing a dry rub for my Thanksgiving turkey, combined with traditional roasting and a good old-fashioned bread stuffing. I picked up my 15 lb. turkey yesterday (Thursday) and rubbed it down, inside and out, and under the skin where possible, with 1/4 cup Kosher salt mixed with 1 teaspoon Sucanat. I then ran out to my still-flourishing herb patch (love the weather we've been having!) and picked generous handfuls of thyme, sage, marjoram, and a bit of rosemary. These I stuffed under the turkey's skin, breast, thighs and backs, wherever I could reach. The turkey will sit in my fridge in the roaster until early Monday morning (and I mean early. One more reason to go for deep-fried...), when it will be stuffed with fresh herb stuffing, loosely following this recipe but also borrowing from my mom's traditional stuffing recipe. This will truly be a Thanksgiving Feast! What are your turkey...or tofurkey preparations? I am usually an enthusiastic supporter of planning. Hence meal plans. Lists. Calendars. Schedules. Today, however, I was thrown by the addition of one appointment to my already hectic day. Last night was a success. Tonight, technically, was also a success, but my equanimity suffered. Last night I was zen through the whole thing and even had time to read the kids a story and construct a lion for D out of modeling clay. Today, while supper got on the table on time, in between a last minute chiropractic appointment for G and me (G had his first, hopefully only...but I can't count on that, tumble down the stairs, and even though he seemed fine, I wanted to get him looked at sooner than later), a preschool executive meeting, and my husband's first night of pilates classes. I started prep as soon as G went down for his nap (1:00), and I continued working on everything until I headed out the door (around 4:30), with of course pauses for diaper changes, pee breaks, plugging in G's soother, nursing G AGAIN, getting D snacks, putting the bbq back together (which was needed for the recipes, and I didn't know until I went out to turn it on that it was taken apart), emptying the dishwasher, and so on. So truly, the entire meal would only have taken an hour to prepare, without interruptions. That was not how today went. The baked spaghetti squash was just the squash, halved and baked in the oven (be sure to scoop out the seeds first) until tender, then the strings tossed with butter, Parmesan cheese, lemon juice, parsley and nutmeg. The nutmeg threw me off. I just did a couple of other searches for baked spaghetti squash, and found some that use basil and oregano. I think I might enjoy those more. Soak the corn in cold water for an hour or so, then place on a bbq preheated to low. Roast, turning occasionally, for 45 minutes. Throw on the peppers for 20 minutes. Remove the red peppers, peel off the charred skins (I actually just shut off the bbq with the peppers and corn still on it, because I was late for my appointment. The peppers' skins were loosened just perfectly after cooling on the bbq). Melt butter and add chopped garlic. Remove husks from the corn and slice off the kernels. Place in mixing bowl and add all the remaining ingredients. Season with salt and pepper and toss. YUM. I kept looking at this recipe and swinging between determination to make it because it sounded so good and the temptation to just boil the damned corn, because my kids would like it just as much that way. I was won over by the recipe eventually, and pulled it off, and am grateful for it. I think I have a new favourite when corn season rolls around again next year. Tomorrow, my parents are coming through on the way to British Columbia to see my sister and her new baby (imminent arrival), so they're stopping here for supper. I had already planned to cook Greek Style Flank Steak with Feta Green Pea Orzo and Greek salad. Should be good. Product Placement #4: Lime Yogurt! I made an exciting discovery yesterday at the Saskatoon Co-op grocery store: Astro brand lime flavoured yogurt!! Why am I so excited about this, you ask? We all know how so much of our relationship with food is linked to comfort and memories. Well, when I was very young, my all-time favourite yogurt flavour was the Dairyland brand of lime yogurt. It was the artificially coloured, gelatin-filled stuff, but that's what yogurt was back then (to me at least) and I loved it. Perhaps part of its appeal was that was so rare. There would usually be one lime yogurt flavour in the cooler, among all the other multitudes of flavours. We always bought it if it was there. And then they stopped making it. I have pined for that flavour of yogurt ever since. I was keen to try the new replacement that several brands offered: key lime pie flavour. But that to me was overly sweet and had that disgusting fake meringue flavour which just didn't do it for me. But now. NOW! Astro's lime flavour is much closer to what I remember. And it has no fake colour or gelatin. I am SOLD. I've been getting somewhat lukewarm responses from the kids lately on my food. This means I'm getting lukewarm responses from D, mostly, because he is the big eater. Baby G sort of picks at whatever is in front of him, occasionally really going to town, but mostly staying pretty steady at moderate food consumption and high levels of dumping food all over the floor. D ate everything on his plate and asked for seconds, and ate a good portion of his seconds. G went for more cheese, and shoveled in handfuls of meat, bread and veggies. He even sampled the coleslaw. And my husband was sold on the aroma from the minute he walked in the door. Success! ...I have a meal plan for this week, just no time to post it. I'll try to get it posted tomorrow. Thanks for your patience! I have been remiss in writing for the past few days, due to intense busyness on all fronts: work, family, life in general. The good news is, our kitchen backsplash has been tiled, and therefore I am quickly running out of excuses not to post photos of the finished renovation. Coming soon! As soon as the grout is completed! Promise. In the meantime, I wanted to share a dinner menu that offers the added bonus that you can toss leftovers all together in one pot, add some chicken broth, and have amazing soup the next day. This has many layer of kid-friendliness as well, since the fish is baked separately from the sauce. Fussy kids (if they eat fish) can have plain fish and rice, while everyone else can ladle on the sauce. Heat oil in medium sized pot for 1 minute. Add kaffir lime leaves and fenugreek seeds and allow them to sizzle for 30 seconds. Leaves should shrivel a bit. Add garlic and sautee 3 to 4 minutes (if you use fenugreek powder like I did, hold off on adding it until you add the garlic. I also found the garlic browned pretty fast, so didn't cook for the full 3 minutes.) Add onions and saute until light brown, about 10 minutes. Stir in the tomatoes, cumin, coriander, turmeric, salt, cayenne, cinnamon stick and cloves. Continue cooking for about 10 minutes, or unti lthe tomatoes have reduced a bit. Add the coconut milk. Bring to a boil. Cover, turn heat down to medium low and simmer for about 20 minutes. Place cod on a baking tray and sprinkle with salt and pepper. Bake at 350F for 15 minutes, or until it is starting to flake. Serve fish with sauce over top, garnish with cilantro. To round off this meal, I made basmati rice (just white this time, for the sake of time, since dinner preparations got started late) with about 10 cardamom seeds tossed in, as well as a pat of butter. For vegetables, I had one last little eggplant left over from an impulse buy at Costco (we never buy eggplant, but I couldn't resist, because they were so cute), so I found this eggplant and cabbage salad recipe. I also found an excellent web resource, Ashbury's Aubergines, for what to do with eggplant. Over 3000 recipes! While the curry has a lot of ingredients, it would have been fast to put together, had I lined up my tomatoes ahead of time. Instead, I went on a wild goose chase/comedy of errors kind of adventure trying to find my husband and the boys who were sent to get tomatoes from my neighbour, except then they disappeared, and there were no tomatoes to be seen. So after that 20 minute delay I had located the tomatoes and could finish the dish. Dinner was quite late that night. The boys quite enjoyed the meal (and we loved it! ), with baby G being open even to the cabbage and eggplant. We ended up with a few fish fillets left over from our large package of ling cod (a generous gift from a friend who had great luck on a west coast fishing trip this summer), as well as 2 cups of curry sauce, rice and some of the vegetables. On Sunday, I played volleyball from 3-6, so tasked my husband with throwing all the leftovers (fish, sauce, rice and cabbage/eggplant) in a pot, adding some chicken stock from the freezer, seasoning it and calling it soup. The results were amazing. And again, Baby G gobbled it up. It reminded me a bit of seafood laksa, and would have been perfect over vermicelli noodles. Instead, we just enjoyed it with the rice added to the soup, and I spiced it up a bit with Sambal Oelek. Afterwards, I thanked my husband for dinner, and he scoffed. "It's not like I did anything. I just tossed a bunch of stuff in a pot and added fish sauce." There's a bit leftover still today, and I'm looking forward to lunch time! When you start with good ingredients, it doesn't take much to make excellent food. "You sure know how to make a guy delirious." My husband loves meat in pastry. Anything remotely resembling a savoury pie gets his enthusiastic thumbs up. 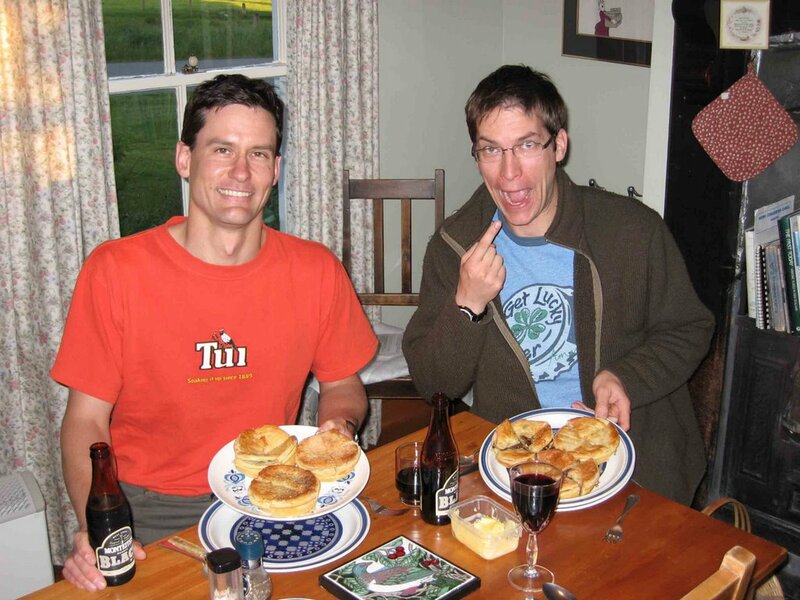 In our past pre-kid travels to New Zealand, we did our best to eat our weight in meat pies—evidence of this is here in a past blog. On our more recent (two years ago recent) trip to Australia, we sampled a few pies as well, with the clear winner being a "Tiger" from Harry's Cafe de Wheels in Woolloomoolloo. This is a meat pie, topped with mashed potatoes, mushy peas and brown gravy. It was surprisingly delicious, and we still think of it fondly. So enter hubby's true birthday, which is a bit of a let-down because we've already done the family dinner and fancy cake the previous Sunday. He has requested ground beef cooked with some kind of tomato sauce for his true birthday dinner, but what I have in the fridge are ready-made pies from The Prairie Pie Wagon. This is Saskatoon's version of Harry's Cafe de Wheels. I had four pies: pork, cherry and wild rice, turkey pot pie, steak and Guinness, and tourtiere. I also had a good quantity of leftover buttermilk mashed potatoes. This got me thinking. Perhaps we could recreate a favourite vacation meal for his birthday? I had some green split peas, and with a quick stop at the nearby convenience store for a package of brown gravy mix (note, I NEVER buy this stuff, but in this case, it was required for authenticity's sake). I boiled up the peas, mashed them, mixed up the gravy, reheated the pies and potatoes, and voila! Nostalgic dinner extravaganza! And the resulting quote regarding delirium. Lucky me to be married to someone so easy to please. And by the way, he had the tourtiere, which I think meets his ground meat requirements. I didn't even outright ignore his request in making this dinner! A true step forward in our relationship. Photo of the pie/peas/potatotes/gravy to come soon...promise! It isn't very often that my husband gets to choose what he wants for dinner. I usually consult with him loosely during my meal-planning and then do what I need to do, taking his preferences, but also what we have to use up, what's in the freezer, and what I'm in the mood to cook, into consideration. I would definitely do the ham this way again, and while everything turned out very well, the cake really did take the cake. I finished assembling it so close to dinner time and it got eaten so quickly (no leftovers) that I completely forgot to take pictures. If you click on the recipe link, though, you'll see it. It turned out exactly like that. And it was surprisingly easy, for something that looks so decadent. While Baby G was all about the main course, D inhaled his cake and then asked for more. Tonight for dinner I'm going to use the leftover ham juice and make my mom's standard leftover ham and rice gumbo, although I'm going to use brown instead of white rice. Basically, you just cook the rice in the ham juice with the ham bone, add chopped ham and a can of brown beans. I might add some onions and celery as well. Very simple, but perfect comfort food. I'm coming down with the cold that has been circulating our house for the past week or more, so I'm really looking forward to a bowl full of steaming gumbo. In 20 minutes, start to finish (at 11:30PM instead of sleeping) I just made a lovely lemon curd. As I was making it, I spent some time reflecting on previous lemon curd efforts, and thought, I'm glad I've now made enough lemon curd in my life to know that simple is best. There are lemon curd recipes that require double boilers, eggs to be separated, and fancy lemons. In my ongoing "quest for the best," I did once turn a rare discovery of Meyer lemons in Saskatoon into Alice Waters' Meyer Lemon Curd. Alice Waters is a hero of mine, and if she recommends a lemon curd recipe, I'm going to assume it's going to be the best lemon curd I've ever tasted. While this has been the case with other recipes I've made from her Chez Panisse collection, it wasn't so with the lemon curd. The Meyer lemon curd was very very good, but it wasn't good enough to justify the extra effort of separating eggs, finding uses for the egg whites, and so on. And basically, the recipe calls for milk as well, which seems to only be required to thin the mixture because the egg yolks thicken it too much. The dead-easy, no egg separating version from The Canadian Living Cookbook was just as smooth (in fact, smoother, because it seems to be more forgiving if you let it get too close to boiling, which I often do) and just as delicious, had a pleasing luminous yellow colour, and was perhaps more satisfying because it took less effort. Sometimes it is worth the effort to undertake a fussy recipe. I often do so and will again. But there are so many culinary challenges out there that are truly difficult; so why make things any harder than they need to be? This, I confess, is one of the reasons I often run out of patience with Martha Stewart recipes. I usually cut out half of the steps and the results are still just as good as if I'd spent the extra hour and followed the directions exactly. In a small, very heavy saucepan, combine all ingredients. Cook at just below a boil, stirring almost constantly, until thick enough to thickly coat a spoon (I find the thickening process to happen almost instantly), about 15 minutes. The mixture will thicken as it cools. Store in covered jar in refrigerator. Spread this on toast or scones, mix half and half with whipped cream to fill tart shells, scoop out of the jar with your finger, or use in any recipe that calls for lemon curd. Mine is an ingredient in my husband's birthday cake. More on that tomorrow. Check out this cream of tomato soup recipe. It tastes very similar to the canned stuff I used to love as a kid, but this time you control all the ingredients and know exactly what's in it. I love that you can throw in tomatoes with seeds and all, because you run it through a strainer when you're done. Baby G (just 13 months old tomorrow) finished off his little bowl, even picked up the whole thing and drank what he couldn't get with his spoon. Goldfish crackers were the perfect accompaniment, which pleased D to no end. I've made this with canned tomatoes and fresh, and I was surprised to find that the canned tomatoes were actually a little more tomatoe-y. Both were good though! I haven't really gotten into singing the praises of Quinoa 365 yet, but I think I'm about to start. Yesterday I spent some time demonstrating to D how to slice apples with the apple wedger without cutting his finger (and also re-stating that he should never touch it without a grown-up's help), which meant I ended up with a large collection of sliced apples, just right for a crisp. The problem was, I didn't have any oatmeal (used it all up making morning glory muffins). I vaguely remembered seeing some kind of crisp or crumble recipe in Quinoa 365, so I looked, and discovered that you can basically just swap out the oatmeal for quinoa flour in your favourite recipe. It isn't like oatmeal is a poorer nutritional choice, but quinoa does have the benefit of a uniquely nutty flavour and a higher protein count. So I guess it depends whether you want to tout your dessert as having cholesterol-lowering properties (oatmeal), or that it packs a protein punch (quinoa!). I realize that not everyone who runs out of rolled oats will have quinoa flour lying around, but if you happen to be shopping at your local health food store and come across some quinoa flour, you may want to pick it up. It may soon become a staple in my pantry. I just discovered the link above for morning glory muffins is no longer working. Here is the recipe! This week's events are a good example of how even the best-laid plans often can't hold up to life with small children. My husband has been out of town. My original plan was to plan a simple meal the first night he was away, and then live on leftovers the second night. First, he didn't leave until after dinner the first night, so my leftover quantities were diminished (I was glad to have him there otherwise, don't get me wrong). He has also started packing a lunch, so my leftovers weren't quite as plentiful as I'd hoped. This meant I needed to actually cook something on the second night I was on my own. That's fine, I just pulled out a fillet of lake trout, since the boys both love fish. Fish and oven fries would fit the bill nicely. However. Right when I was supposed to be starting dinner, D decided to check out my new Pampered Chef apple wedger, and promptly sliced his thumb open to the point where he needed stitches. I called my mother-in-law for back-up, so I didn't have to deal with both baby G and D in the waiting room and while D needed to be held down for his needle. We waited about an hour, from 5:30-6:30, and after the stitches (two), we were out of there at 7:15. I had warded off hunger with a few snacks, but we still needed to eat. I decided to do the quickest option, and picked up Vern's pizza by the slice. Truly not my favourite pizza, but it filled a void. Fish is still in the fridge, ready to be cooked tonight. Because of this series of fortunate events, I was also low on lunch items for my sitter and the kids. Due to my weakened emotional and mental state after yesterday's challenges, I caved and pulled out a package of hot dogs. Now, this may not be a big deal for many people. But let me provide some context. When I left home and moved out on my own, when I was 17, I promised myself I would never buy hot dogs. Smokies and Kraft Dinner were okay, but I drew the line at wieners. I wanted to make sure I cooked and ate well and never gave in to the easy fix. This has truly served me well, gave me a great start on my life as a foodie, and I honestly never did buy hot dogs for a quick, easy meal. In the past 20 years since I left home, I can count on one hand the number of times I purchased a package of hot dogs. And then, only because we were having a wiener roast. Even for wiener roasts, I usually opt for something more recognizable as meat, like sausage. Case in point, the hot dogs in my freezer were left over from G's birthday cook-out, and they didn't get used because everyone chose the smokies I brought instead. But there they were, along with a can of beans, and because they were there, I gave in to it. Gave Grandpa the lunch plan instructions. And promptly headed out the door to work at Caffe Sola, where I enjoyed delicious tomato soup and a fig chevre tart for lunch. I'm a hypocrite, I know. But only today. And I feel compelled to confess. That's something, isn't it? I'm not sure it makes up for today's transgressions, but I did feed my boys hot 12-grain cereal for breakfast, and then turned the leftovers into cookies. I always feel guilty when I have leftover porridge, because it's so good for you, and I hate waste in general. I made oatmeal bread with leftover oatmeal recently, and it was wonderful. So why not cookies? Mix together dry ingredients, mix in butter and eggs until creamy (2 minutes or so) and the stir in porridge and raisins. These turned out to be kind of cakey, sort of a cross between hermits and toothy snickerdoodles. I will make them again, and when I do, I will use brown sugar instead of white, use half whole wheat and half white flour, and a 1/2 t. vanilla. They were good enough for me to eat three of them while still warm...as well as the leftover hot dog. With mustard. It's not like I get that chance every day. My original plan for Tuesday night's dinner (meat, grain and greens loaf, grilled squash and tomatoes) got fancied up a little, thanks to Pine View Farm's suggestion to stuff pattypan squash. It was pattypans that I had, so I decided to stuff the meatloaf into the squash. The remainder of the meat mixture, I patted into muffin pans to make mini-loaves. The tomatoes also got fancied up as well when I stumbled across an herb- and cheese-stuffed tomato recipe in The Occasional Vegetarian while looking for a tomato soup recipe. Simply toss fresh herbs (oregano, thyme and parsley) with shredded cheese, breadcrumbs, salt and pepper, press over seeded tomatoes (I didn't cut the centres out, just cut them in half and gently pressed out seeds and pulp) and drizzle with olive oil. Bake at 350F and then brown briefly under the broiler. I also added fresh corn to the menu because my dad stopped by with some of the corn picked by my grandfather and uncle. It was delicious. The meal ended up being much prettier and more delicious than I had expected (although the meatloaf wasn't terribly flavourful, it was good for us, and we spiced it up with a ketchup/hot sauce combo...I NEVER use ketchup, but this dish called for it). No matter how far removed we think we are from the farm (and I admit I'm not all that far removed), Saskatchewan people still scurry like squirrels at the first sign of frost. Tonight is the night. It's midnight, and the thermometer reads 3.4 degrees Celsius. Our neighbours came home from the lake a day early; my dad was in the city but rushing home to help my mom pick vegetables; my grandfather and my uncle were picking corn, cucumbers and amaranth; my cousin was also rushing home to instruct her husband on what parts of the garden needed to be covered; I was outside just before dark, picking basil and gathering the remainder of my meagre harvest: 4 yellow zucchini, 15 beans, 1 tiny Armenian cucumber (the only one my sad little plants produced), 7 red and 12 green tomatoes. Combine all ingredients in a food processor and process into a paste. Can be refrigerated up to a week or frozen up to 3 months. The remainder of my basil, once I run out of pine nuts and Parmesan to make pesto, is simply processed with a pinch of salt and enough olive oil to make a paste, and then frozen. This is super handy in the middle of winter when a recipe calls for chopped basil. That little patty or ice cube of pureed herb is probably equivalent to a quarter cup of loosely chopped basil, and each time I taste it, I am delighted. Happy hunkering down for all you foodies preparing for fall. I am already anticipating delicious winter soups and stews. And to those in the southern hemisphere preparing for spring, and those of you in climates where you can pick fresh basil all year round, please don't rub it in. I realized tonight that I have passed a milestone that needs to be acknowledged. In 2002, my husband, who then worked at a print shop, brought my burgeoning, chaotic stack of recipe clippings—some from magazines, some hand-written, others printed from websites—under control. He encouraged me to think about how I would organize them (which I like to do up to the concept stage, but never manage to get past that). He then took my list of groupings, bought me two large binders, and printed out tabbed dividers with titles like "Appetizers", "Breakfasts", "Meat", "Seafood" and so on, according to my directions. It wasn't until I was laid off that summer that I actually found the time to organize the binders. But when I was finished, I loved them and used them constantly. I have to say though that 3" and 4" binders can be a little unwieldy. They have grown over the past decade to be chaotic once again, and they have been bursting at the seams for several years now. I do not pretend to be finished with this project—there is still close to a three-inch binder of loose pages that need to be relocated to the new system; there is also a box (or two) of clippings and magazines yet-to-be-clipped in my basement. It's an on-going process. I may need to do further divisions in the future, or expand to larger binders. It's an evolution. And don't even think of suggesting I digitize. And yet, while this project will never be complete, as I placed those eight new binders on to my newly built cookbook shelf in my newly renovated kitchen, and bid farewell to the monster binders that I have pored over and handled ragged for the last nine years, I feel that this moment should be marked somehow. It's bittersweet. Growth and change. You can't embrace them without a tiny sense of loss. HOWEVER. No sense of loss is worth NOT doing something. My ultimate reward came tonight when I pulled out a loose set of sheets from one of my old binders' back pockets and came upon a recipe that I had thought lost to me forever. Hazelnut Shortbread! Just in time for Christmas baking planning for 2011! And I didn't even drink all of the Frangelico I bought in order to make the cookies last year! On rimmed baking sheet, toast hazelnuts in 350F oven until fragrant, about 15 minutes. Place nuts on a tea towel; rub briskly to remove as much of the skins as possible. Let cool. In food processor or with a sharp knife, chop finely. In a large bowl, beat butter with sugar until light and fluffy. Beat in liqueur and vanilla. Stir in cornstarch and salt, then flour, 1/3 at a time, to make a smooth dough. Add nuts and stir gently till combined. Divid dough in half. Refrigerate until firm but not hard, 30 to 60 minutes. Bake at 325F until golden, 15 to 20 minutes. Let cool on pan for 2 minutes, then transfer to racks to cool completely. Hazelnut glaze: Whisk together ingredients to make a smooth, spreadable glaze. Spread over cookies. Now I know this sounds fussy. Yes, the last time I made them was before I had kids. But I liked them enough to remember the recipe years later, so I will make them again, if only as a thank-you to the Universe for leading me to my long-lost recipe.